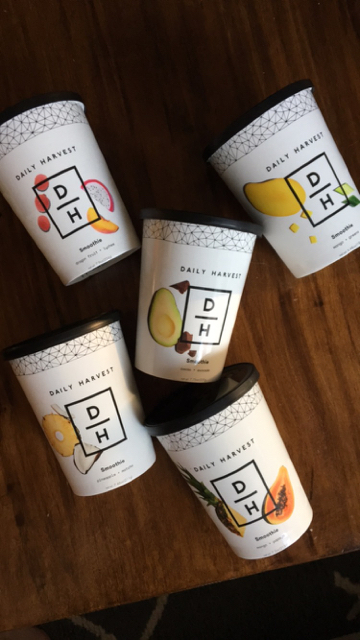 Daily Harvest is a subscription service that sends super foods in pre-portioned containers for easy mixing, blending or cooking. 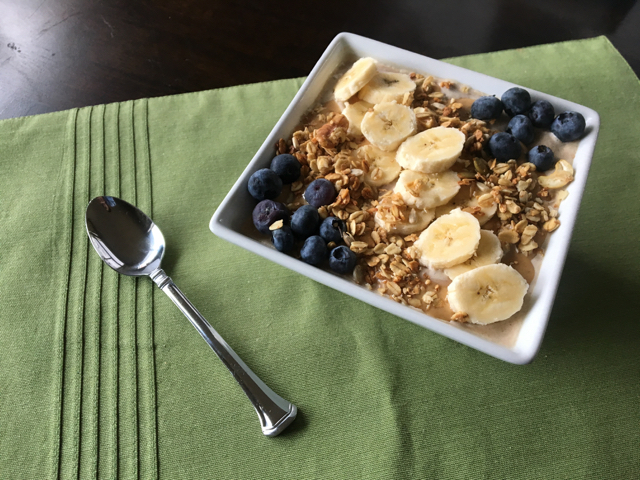 Their offerings range from smoothies, vegan ice creams, and lattes to soups, overnight oats and harvest bowls. While they have a great variety of options they all have one thing in common — organic super healthy ingredients. But are they worth all the hype? I'm here to give you my completely honest review of Daily Harvest. I was most excited to try their smoothies in hopes I could then create my own at home smoothie bowls complete with colorful toppings. While I succeeded at that endeavor — The overall cost and time to put together does not make it worth it for that reason alone. Do I love having a few fresh smoothies or bowls in my freezer when I need a quick snack? Yes. Am I going to start stocking up so I can make a daily smoothie bowl? Absolutely not. Convenient for sure. You can't make healthy eating any easier than this. Fruits and veggies are peeled, chopped, and perfectly portioned into to-go cups. Easy to not only toss into your freezer, but super simple to whip up and eat. If "I don't have time to eat healthy" is your excuse this service is for you. Great blend of super foods. I can't argue with the fact that each cup is packed full of superfoods I wouldn't normally buy or think to put into smoothies like walnuts, dates, or zucchini. Not to mention a dash of something green in almost every one from either kale or spinach. You can chose to get deliveries weekly or monthly - and the more cups you choose per shipment the cheaper the price is per cup. Even at the cheapest option of 24 cups delivered monthly - or 24 cups delivered weekly - you're spending 6.99 /cup which is costing you close to $170. The soups and bowls are just not enough food for one person to eat as a meal. I have added extra rice, quinoa or and/or broth to all of the cups to make them filling enough for me. That being said the flavors were good - you can tell they are packed with spices and not sodium. When it comes to smoothies those may seem like a big serving at first — until you read the label and find that one cup is actual two servings. To the fine folks at daily harvest I ask you — who in their right mind is going to make one of these and only eat half. Or crazier yet - share. No way that whole cup is for me no matter what the back of the cup says. This is my internal struggle with any food subscription box - the box. And all the packaging that comes WITH the box. The cups are wrapped in an insulated bag on dry ice which needs to dry out overnight. Great that there are no ice packs to deal with but what to do with the insulation? There are no instructions (that I saw) on the box as to how to properly dispose of this stuff. So to be clear this is not an issue with Daily Harvest specifically — but it is one of the reasons I tend to opt for less frequent shipments. It takes a lot more liquid to blend into a "smoothie" consistency - and then is too much to fit back into the cup. I guess "overflowing" smoothies make great Instagram photos — but not super convenient when you are trying not to waste any. So if you want to take it on the go plan to have another vessel to pour your smoothie into because it's not going to fit into that tiny cup. When it comes to taste - I'll be honest I was a little disappointed in the flavors of my first box. (Acai + Cherry, Blueberry + Hemp, Chai + Coconut, and Cold Brew + Almond) It's not to say they were BAD they were just bland. Nothing stood out as overtly fruity (which I like) or strong in flavor). I chalk this up to possibly too many ingredients so that nothing really comes through as the shining star flavor. And then I made the rookie mistake of not changing my order before the second box shipped — so I had TWO boxes of underwhelming smoothies. Once I started changing up my shipments with different options each time and found flavors I really liked my opinion took a 180. I also started making the smoothies as true smoothies with more liquid, instead of trying to bouge it up with a smoothie bowl. Let's leave that to the experts. Current Fav flavors are Dragon Fruit + Lychee, Pineapple + Matcha and Mango + Papaya. Aka all the tropical flavors that require a lot of cutting/prep of large or difficult fruits. So there you have it. Some likes, some dislikes, and If you're interest is piqued and you want to give it a try - use this link and get 3 cups free on your first order. Then come back here & tell me - do you love it? Is it worth it? If you have tried Daily Harvest - what's your favorite thing to order?